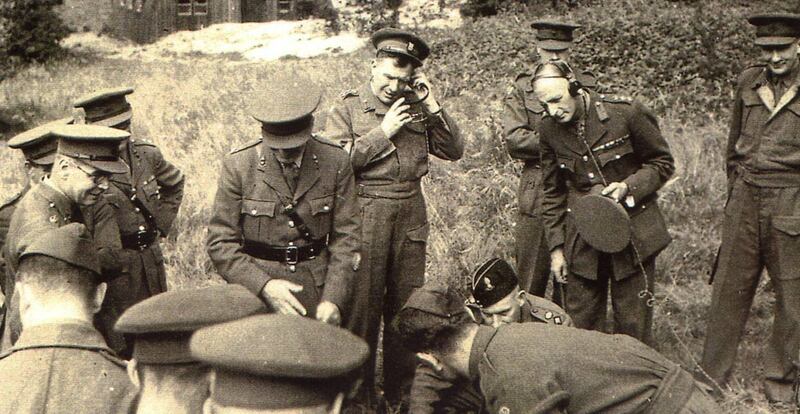 Chief Engineer SE Command, Brig John Stone OBE MC (centre) listening to a 'ticking 17 fuze'. Lt Col Wilbraham (right), Lt Col Lynn (in dark forage cap by the bomb) and Col Nott-Bower (bareheaded) - all at a demo for 'Bigwigs'. Photo courtesy of JH Setchell MBE ERD. In June 1988 the four TA Squadrons of 33 Engr Regt (EOD) were formed into 101 (City of London) Engineer Regiment (EOD) (V), commanded by Lt Col J Marsh RE. A List of Commanding Officers of all BD / EOD Regiments is planned and this website will be updated in due course. Royal Engineer Bomb Disposal has a rich and interesting history.